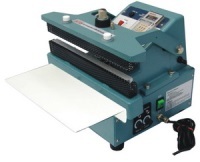 Automatic constant heat sealers are ideal for the sealing of poly-cello films, humidity proof cellophane films, polyethylene films, aluminum foil coated bags and gusseted bags. 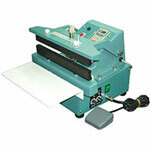 This automatic heat sealer is perfect for creating a wide seal on thick bags. It uses a timer to determine how long the machines jaws will stay open and closed during the heat sealing process. The timed closure ensures an even and consistent seal. 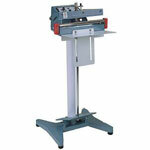 The operator is hands free to handle the product quickly and efficiently. 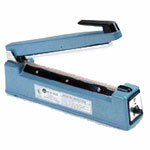 Automatic heat sealers generally increase worker’s productivity. An electronic foot pedal is also included for easy manual operation. 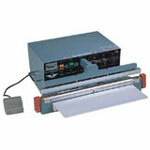 Boatman Marking offers a wide selection of automatic heat sealers.